Display this cheery gingerbread house as a reminder of the home-baked goodness of the season. With its removable roof, it doubles as a unique container for individually wrapped goodies. 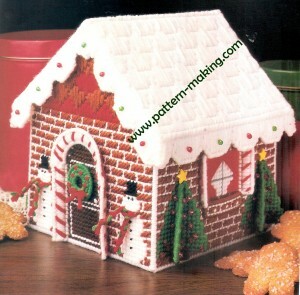 GINGERBREAD GOODIE HOUSE Size: 8″ w x 11″ h x 8″ d Supplies: Worsted weight yarn (refer to color key), seven 105/8″ x 135/8″ sheets of plastic canvas, two 4″ dia plastic canvas circles, #16 tapestry needle, ten 4mm green beads, 108 – 4mm red beads, 24 – black seed beads, four 1/2″ yellow star buttons, sewing needle, and sewing thread Stitches Used: Backstitch, Cross Stitch, French Knot, Gobelin Stitch, Overcast Stitch, Pattern Stitch, and Tent Stitch Instructions: (Note: Use a double strand of yarn for Pattern Stitch and for horizontal and vertical Gobelin Stitches.) For Roof Sides, cut two pieces of plastic canvas 48 x 35 threads each. Use white to cover pieces with Pattern Stitch. Match edges and use white to join Roof Sides along one long edge. Follow charts to work Front/Back Eaves and Side Eaves. Match. ‘s and ‘s and use white to join Front/Back Eaves to Side Eaves between ‘s and x •s. Refer to I photo and use white to join Eaves to Roof Sides. Use white Overcast Stitches to cover unworked edges of Eaves. Sew green beads to Eaves at ‘s. Sew red beads to Eaves at ‘s (Note: For a sturdier house, use a double thickness of plastic canvas for Front, Back, and Sides.) Cut two pieces of plastic canvas for each Front, Back, and Side. Match edges and hold pieces together while stitching through both thicknesses. For Arch Sides, cut four pieces of plastic canvas 4 x 19 threads each. For each Archway, refer to chart and use sewing needle and thread to join two Arch Sides to Arch Top. Follow charts and use required stitches to work Archways, Wreaths, and remaining pieces. For each Archway, use white and match ‘s to join Archway to Front/Back. For each Wreath, thread an 8″ length of red yarn through Wreath at *’S. Tie yarn in a bow and trim ends. Refer to photo and use green to tack Wreath to Front/Back. Refer to photo to sew seed beads to snowmen for eyes and buttons. For each scarf, knot two 12″ lengths of red and one 12″ length of green 1;4″ from one end. Braid yarn for 4″ and knot remaining ends; trim remaining ends to 1;4 “. Thread scarf through Front/Back at ‘s and knot. 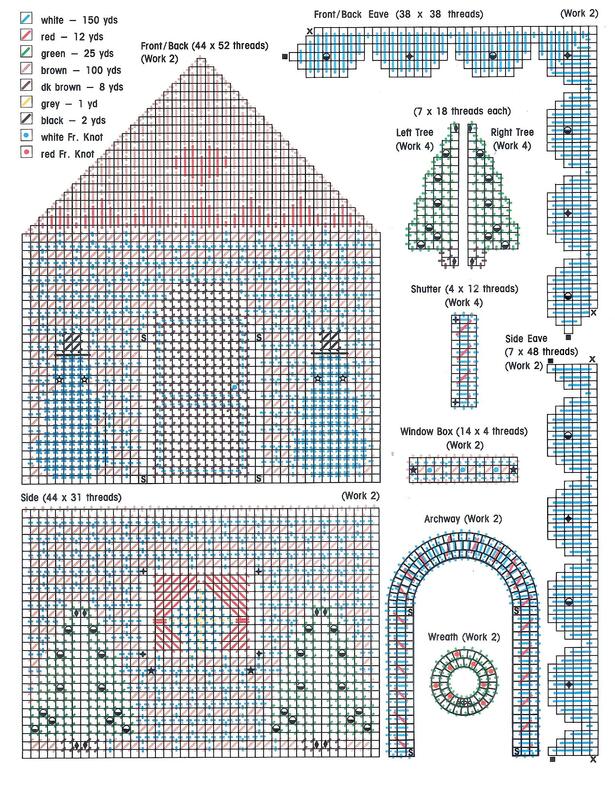 Sew red beads to Sides, Left Tree, and Right Tree at ‘s For each tree, refer to photo and match ‘s to place Left Tree and Right Tree on Side with right sides up. Use green and work through all thicknesses to join Tree pieces to Side along unworked threads. Refer to photo to sew star buttons to tops of trees. For each Shutter, use white and match ‘s to join Shutter to Side along unworked threads. For each Window Box, use brown and match ‘s to tack Window Box to Side. Refer.to photo and use white to join Sides to Front and Back. For Bottom, cut a piece of plastic canvas 44 x 44 threads. (Note: Bottom is not worked.) Use white to join Front, Back, and Sides to Bottom along unworked threads.